Cyril Ramaphosa: This is a fun night. We’re not really meant to have speeches. We’ve heard all the wonderful speeches today and many of you who we hadn’t seen in some of the sessions we were in have been busy, I’m sure. The press conference that we had the media in, Minister Mboweni kept on saying, ‘why is the Minister of Finance here?’ So, it’s good to have you here, back from what you were doing or not doing. So, the media was more interested in you than in anyone of us. So, maybe you will tell us later what makes you so famous with the media. Maybe it’s the tweeting that makes you… They were hoping that you would have tweeted something that is more exciting about being here in Davos. Ladies and gentlemen, thank you very much for being here. We are, as much as this is a fun moment, we’ve got a number of people who come from a number of other countries and we would like to welcome you and we are really humbled by your presence here and the support you continue to give to SA. Many of you, as I’ve looked around the tables, have been with us for many years. Some of you are investors. Some of you are fellow travellers, some of you are interested in our story. Earlier I saw, who did I see earlier, I saw so many people. I saw Claire Blair, who is here – there she is. It’s you I wanted to welcome rather specially. It’s wonderful, Claire, that you have found time to come and dine with us. Let’s give her a round of applause. There are quite a number of other people… Mrs Blair. Here’s to Cherie Blair, and I saw Tony earlier and he’s looking good. He still talks a lot of sense after all these years. I thought when you retire as a politician you start losing some of your marbles, but he hasn’t. It’s wonderful so, thank you all for being here. We’ve had a really wonderful day. A very busy day and all of us have been all over the show and this is time to let our hair down and to relax, and to enjoy South African cuisine and the food, and the wine I meant to say, so this is the moment that we can just relax and be social with one another. We are pleased to say that our reception here has been very good, once again. We’ve been well received. That’s certainly the impression that I think many of us have had. Both by the media, as well as a number of participants here, in Davos, because they are recognising that we are a country on a new journey. We’ve entered a period of renewal and have embarked on a new journey, and I think many of us are feeling a sense that this is the type of journey that we’ve embarked upon. When we had a pep-talk during the week, last week preparing to come here. It was a number of you who said, as we were trying to craft a message about what we are going to say when we come to Davos because a number of you, particularly people in business, who said, ‘Mr President, we’ve got a very positive story to take to Davos.’ Let’s not downplay the progress that we have made. Let’s not put ourselves down, and let us go and tell the world precisely what we have been doing over the past few months. What we have been doing is quite phenomenal. It really is great and many people are recognising it. Recognising it in a way that they interact with us, even the questions that they ask. One of the questions they asked me on two occasions was, we want you to tell us the formula. Give us the formula of how you have been able to craft this collaboration between business, government and labour. Just tell us what the magic is because they say they don’t see it in many places in the world. Stephen Koseff had actually said, when he was in one meeting overseas that a bit of admiration had been expressed on how we collaborate. Today I was asked by two people and I explained that there is a renewed determination on our part, as South Africans, to make SA work, and to take our country forward. Having realised that we’ve lost the past nine-years. The past nine-years could be regarded as lost years, where we lost our way, both at a political level and may I say, an economic level as well. People recognise that but also give us respect for having acknowledged that we did lose our way and that we are now on a path of renewal having recognised where we lost our way. They also recognised that we’ve been pretty open and honest, about how we lost our way on a number of fronts, and they say, that just enhances our image because they can see that we are a serious lot of people and the collaboration that we have forged and continue to forge, between labour, business, community and government – it holds well for the future. This is precisely what we are also showcasing tonight. Tonight, to have this type of dinner, where we collaborate and where I don’t have Stephen Koseff shouting at me. It’s maybe the sport sometimes. When he’s upset with something, he calls me and says, ‘what are you guys doing?’ I often say, Stephen, I’m the president, and then he goes quiet and says, ‘sorry, Mr President.’ So, the shouting and all that has come to an end because we’ve deepened collaboration. We are deepening it on an ongoing basis and I think the other important thing is that we’ve developed a method of listening to one another. Listening to one another, even if somebody comes up with crazy ideas and sometimes, they do, and quite a number of business leaders here will say that we’ve got this idea, and then we’d say, ‘that’s a mad idea – drop it.’ Then they say, ‘okay, we’ll come back with another one.’ But that is the openness that we’ve engendered. That people should be treated as South Africans with respect. They should be able to come forward, even with unsolicited ideas, put them on the table. We interrogate them, discuss them, and if they are cogent and weighty enough, we can then take them forward and either implement them. So, we are a realistic government and that is the impression that I would like everyone to have. This is your government. We are all South Africans and our motto is, ‘let’s work together to make our country great’ because greatness is what really awaits us. If we can do a number of things correctly, and we may be taking baby steps in a number of areas but these are areas that we want to work together with all of us on, with labour, business, as well as communities and government. The world that is unfolding before us now is a world where collaboration is going to be more and more the order of the day. Where we’re going to have to be working together. I’ve just come back from Geneva, where we were launching a report, and ILO report on the future of work. The ILO, as you know, is a combination of business and labour in cities around the world. It was formed in 1919, after the First World War, where the founders of the ILO, both business and government felt that they needed to address the challenges of the time. The challenges of the time still remain the challenges of today. We were launching this report on the future of work. How do we address the challenges of the Fourth Industrial Revolution (4IR), where people are going to be replaced by robots? How do we anticipate everything at the head of the curve? So, these issues we’ve concluded as the ILO collaboration team that can only be best handled when we all work together. When there’s deep collaboration between labour, business and government. In our case, in SA, we include communities, and we’ve been able to achieve a great deal for the collaboration that we have forged, which includes communities as well. For me, it’s inconceivable that even, at any endeavour, be it business or even government projects or whatever – that one can execute those without having deep collaboration with a number of role players. This is what we want to showcase more and more, through the world and I would say, maybe this is what Nelson Mandela bequeathed us because it has become part of our DNA to be able to collaborate, do things together, and do them so well and so perfectly. Only because we can work together. It is for that reason that we are saying, our country is on a journey. The past nine-years were lost years, but we cannot continue to be mourning the lost years that we’ve had. We now need to pick up our socks and say, ‘together we can put our country in a much better position, reposition the country.’ Our businesses, our education, our health system – you name it, and go and mobilise investments and bring them home to SA. This can be done in a very direct and important manner. And we can deal with issues that are complex and difficult – the land question, we can deal with it and find answers. It is when we find answers that we are able to really move the country forward. Then I told a couple of presidents on the African Continent, at the AU that this is what we’ve done. They said, president, can’t you tell us more details how you get to do something like this? Quietly, I said, this is our DNA. This is how we do things in SA. So, we want to do much more and the Investment Conference that we have, which we are going to repeat this year, which is good example that we are able go into together and get the commitments. During the course of the day we’ve had a number of discussions, both on a financial basis, and the otherwise convening sessions. On a bilateral basis some of the companies that came to me. Commitments that they invest more confidence. They’re saying to us, ‘we actually want to do more – we want to go a mile further’ and that, to us has been very encouraging. Very encouraging people like Jacko Maree, our investment envoy. They’ve been doing a lot of good work, Trevor Manuel, Mcebisi Jonas, and Phumzile Langeni, they’ve been doing fantastic work. Controlling the whole thing. When I appointed them some journalist said, ‘are you not actually denuding the role that ministers should have?’ I said, no, it is going to compliment what ministers should be doing. Indeed, that it is exactly what it has been able to do because people like Jacko and others have been able to reach places where we have not been able to reach and their participation, together with us here is just proving a very good point about how working together with people, who are not necessarily in government. Some of you will be called upon. Let me put my cards on the table. I will want to call upon some of you to come and play some role in helping us achieve the goals that we have. A number of you are already involved with us, in government, and may I say, this is really giving us a great deal of strength. We want to draw on your intellectual capital. We want to draw on your experience. We want to draw on your knowledge base so that we can utilise as many talented South African to take the country forward. I want to conclude by saying, not only that our presence here is needed Actually, we are humbled. We are humbled that we are now noticeable for the good things. In the past we used to be noticed for the bad things that we were doing. But now we are being noticed for the good things that we are doing that takes the country forward. We’re being called upon to play leadership roles in a variety of forums. Some of you are leading a number of… And we know that you’re flying the SA flag and we’re grateful for that. We do that with a good measure of humility. In the past there was a little bit of arrogance and bravado and show-off. But now we should do everything that we are called upon to do, either on the world stage or anywhere, with humility. Because that is how Madiba was – a humble, towering giant of our country but he was able to attract as many people as he possibly could because he was humble, and this is the one distinguishing feature that we remember about Madiba. I say, that is the one attribute that we should display, even as South Africans. So, the grass on our country is coming back. The recognition is coming back and people are becoming much more attracted to us, and let us play that role, with dignity, and with the humility that it requires. 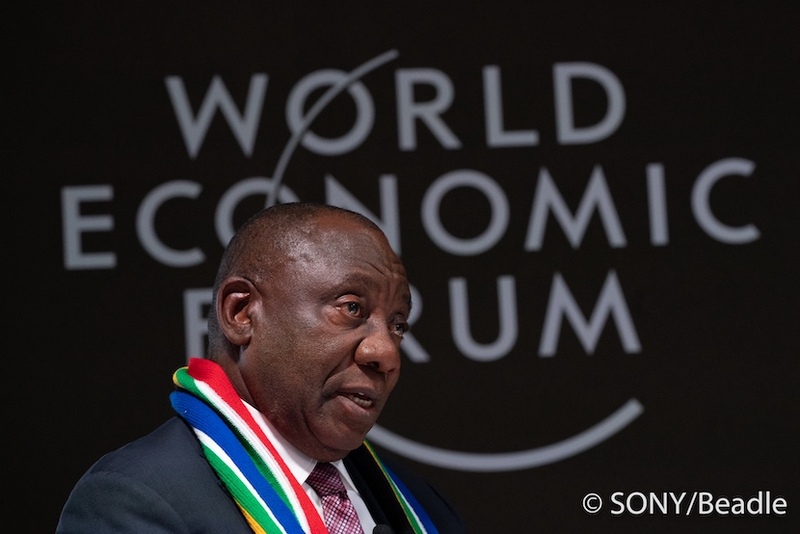 I can say that, ‘yes, SA is back – we are definitely back’ and we must play our role, and our role is an important one, both on our Continent and globally as well. We may not be very good at sports or some sporting events, but I think in terms of our intellectual prowess and in terms of what we can contribute to the wellbeing of the world is great. In terms of business – let us continue attracting businesses into our country and the potential investors, who raise issues – we can deal with them. So, I would like to thank you very much for being here and let’s have a fun night and let’s enjoy ourselves. Let’s look forward to the next Davos once again. Thank you very much.